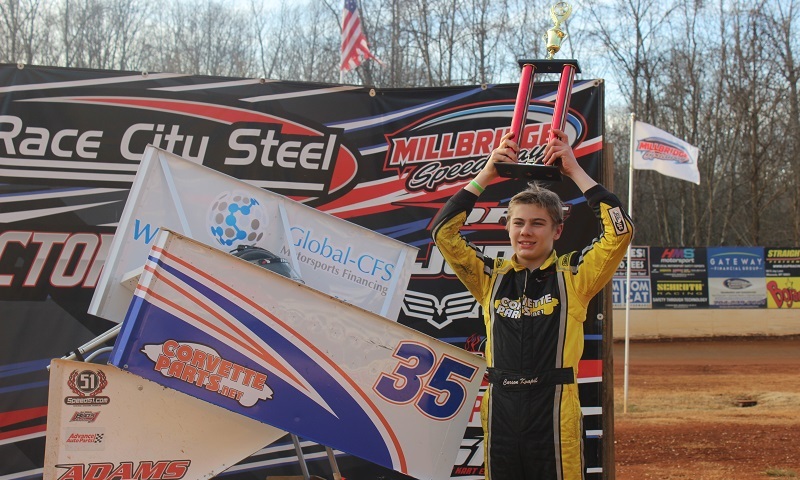 SALISBURY, N.C. — Carson Kvapil capped off his 2017 season with a flourish Saturday afternoon at Millbridge Speedway, capturing the Open division feature win during the third race of the sixth-mile’s annual Winter Series. Kvapil started from the pole in the 15-lap main event and never trailed, racing away to a 4.485 second victory over fellow teenager Joey Robinson. The victory marked Kvapil’s 12th Millbridge win of the year and his eighth in the premier Open class. In other racing, Matt Brellsford replicated Kvapil’s performance in the 15-lap Mini Cup feature, dominating the field and pulling away to a five-second win over Brett Suggs. Daniel Durham completed the podium in third. Despite consistent pressure from Tyler Letarte, Caden Kvapil made it a family sweep of the top two outlaw kart classes, leading all 20 laps from the pole to notch the win by .678 of a second over Letarte. Brent Crews rallied back from a spin on lap nine, which drew the only caution flag of the 20-lap run, to finish third ahead of Robinson and Ben Studer. The most entertaining race of the day was the 20-lap Box Stock main event, in which Matt Francis fought off a spirited drive from Aiden Turner to capture the victory in a thrilling finish. Turner started from the pole with Francis to his right flank, leading the first two laps despite an early five-car melee in turns one and two that illuminated the yellow lights on the opening round. Francis finally powered inside to take the lead down the backstretch on lap three, holding steady out front until a caution at halfway for a spinning Jonathan Shafer slowed the pace again and restacked the field, giving Turner a chance to regroup and attempt to pounce. None of Turner’s advances would work however, despite another yellow with two to go that set up a green-white-checkered finish. That incident allowed Hunter Kohn to surge to second with a last-lap, last-turn pass of Turner, while Francis scooted home to the win by .433 of a second. Lucas Sipka notched a career-best fourth-place finish, with Sam Corry completing the top five. Coen McDaniel scored his third-straight Beginner Box Stock winter win with his new Phantom Chassis kart, beating out Dallas Griggs, Chase Spaulding, Jonathan Paulk and Jackson Shafer in that 15-lap feature. 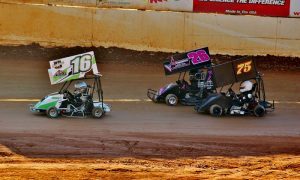 The next activity for Millbridge Speedway will be to honor the track’s 2017 champions during the annual awards banquet on Jan. 6.